Dr. Mushira Ali provides a wide range of restorative, cosmetic and preventive dental services to patients of all ages. She is also certified for Invisalign® and laser treatment procedures. 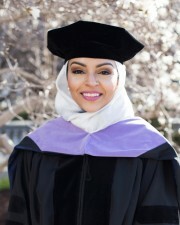 Dr. Ali earned her Master’s degree in Biomedical Sciences from Barry University in Miami Shores, Florida, and went on to receive her Doctorate of Dental Medicine from Midwestern Dental University in Downers Grove, Illinois. She became interested in dentistry at an early age. Growing up, her family could not afford dental care. As she got older she visited the dentist regularly and quickly became fascinated by the dental industry. With each visit, she looked forward to learning more about the dental field which would eventually become her career vocation. Dr. Ali has volunteered with the Bright Island Outreach in the Dominican Republic, helping children learn about proper dental hygiene and has also devoted her services to the Feed My Starving Children charity. When she’s not in the office, she enjoys traveling, photography and considers herself a “foodie”. This place is great. Marci, Brooke and Dr Keiser are awesome. They took my fears away. I will be returning and referring people to them. Love this Mishawaka office. I have been coming to The Dental Center for years. My visits have always left me feeling better than when I came in. The staff is so friendly and upbeat. I have always received the best of care. Worked great with my three year old! Very friendly and encouraging through your entire appointment. Very patient friendly, not many people like going to the dentist but everyone in the office makes it a pleasurable experience. Any doctor/dentist visit can be stressful but it’s anything but that at The Dental Center. You all have made my visits very pleasant. Great customer service! The hygienist and doctor was extremely gentle and caring. They respected my privacy during my visit. I highly recommend The Dental Center!! Freindly and caring staff and dentist. They explain everything they are doing. They make sure you like their work before you leave. Explained what was going to be done and during procedure, made my daughter comfortable.